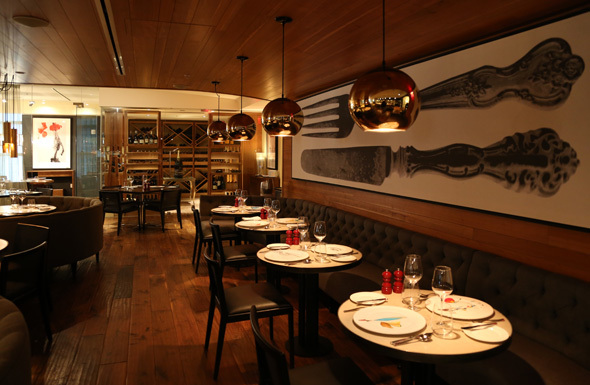 TOCA is the destination restaurant at the still new-feeling Ritz-Carlton Toronto. When making a visit here, it is absolutely necessary to tell everyone that you're going to the Ritz. But don't say it like it's a big deal; it's important that you be nonchalant about it â otherwise you'll lose all the cachet that goes along with dining at the Ritz . With that bit of douchebaggery out of the way, I can confess that TOCA isn't actually over-the-top fancy or exclusive. Far from a bad thing, this just means that the room feels both upscale and comfortable, a good combination. To some extent, it needs to be this way. Because one of the primary functions of the restaurant is to serve hotel guests, it's open for breakfast, lunch and dinner. So there's no white tablecloths here. What you will find, however, is an in-house cheese cave and wine cellar, which add a certain dignified element to the restaurant. More on the former later. Under head chef Gihen Zitouni TOCA shows off obvious Mediterranean influences, which were on display with the first dish I tried, the Black Rice Risotto with Seared Sea Scallops ($39). Like the decor, it's plated with elegance but resists fussiness. The scallops are well-browned and pair well with the creamy rice (which tastes far better than it looks), while the chanterelle mushrooms provide a welcome divergence in texture from the other elements on the plate. If there's a complaint to be made it's with the dollops of aioli that dot the risotto. 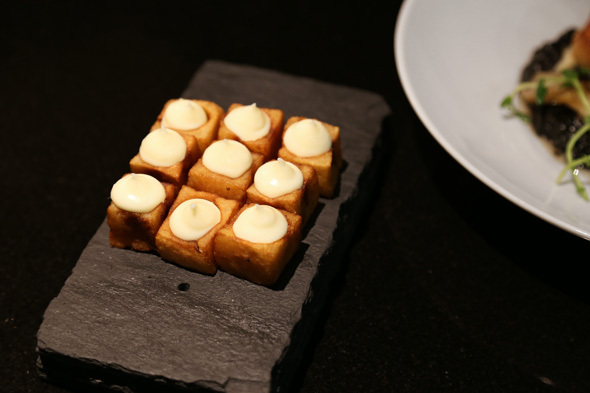 While they up the overall creaminess of the dish, the garlic is subdued, which makes it a bit too mayo-like for my liking. Ordered alongside the scallops, the Potato "Tiza" (6pc. $12 / 9pc. 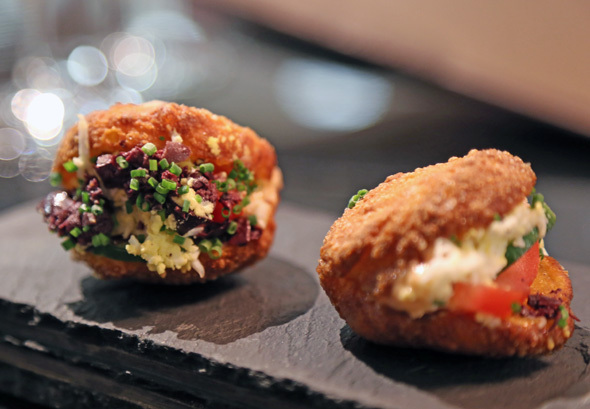 $14) are little squares stuffed with braised veal, spicy tomato jam and the same aioli found in the risotto. Alas, the ratio of aioli to the other ingredients is tipped too far in the former's favour, which makes the dish somewhat one-dimensional and leads to an aioli overload when paired with the risotto. I round out the savoury portion of lunch with the Tunisian Fricassee Sandwich Bites ($4 each), which feature albacore tuna, harissa and kalamata olives. This is a complex little sandwich with a subtle amount of bite and a good thing to order if you're not looking to eat something too heavy at lunchtime. Caveat emptor: the taste of olives will linger long after you're done with your meal. Although I'm not big on dessert, the Planet Chocolate ($11) is something of a showstopper. The table side presentation is fun, as the server pours hot chocolate sauce over a white chocolate sphere, which melts to reveal even more chocolate on the inside. 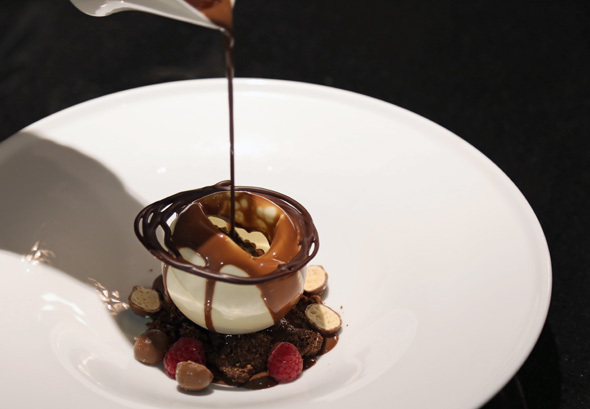 It would all be too much chocolate for this salt-first palate, but the dessert comes into its own when paired with a 2007 Pillitteri Cabernet Sauvignon ice wine ($18, 1oz. ), which despite its own sweetness, tames the chocolate explosion in my mouth. Speaking of wine, the list has its fair share blockbusters (the vertical of Opus One in the wine cellar would fit this description), but is actually targeted very much toward the by-the-glass drinker, with approximately 50 options to choose from. That's surely a good thing, because one of the highlights of my meal was the cheese tasting. 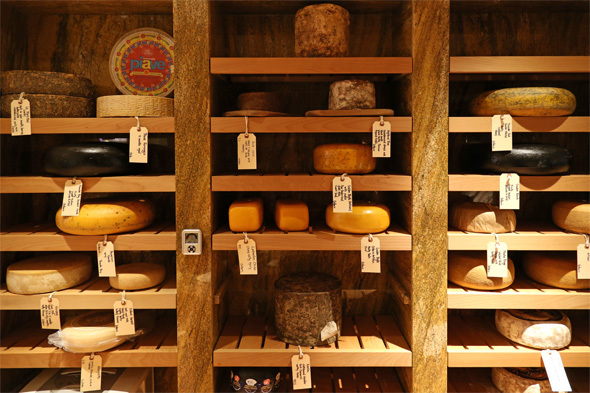 Guests can explore the in-house cheese cave before selecting what they want, an experience I'd recommend. Even if the room is on the small side, it's fun to get in there and poke around (so to speak). Once you've got a few in mind, the servers are happy to help you find an appropriate wine pairing. Of the cheeses I tried out, the best is surely the 10 year old "le silo" cheddar from Quebec ($7 for one selection, $18 for three). While sharp, it's far less so than one might imagine, which matches it well to the "Tres Picos" Garnacha from Campo de Borja ($20 6oz., 2010) that I enjoy alongside. TOCA might not be the fanciest hotel restaurant you'll kind find in Toronto, but I maintain that this is actually a good thing. From the Mediterranean-inspired menu to the ample by-the-glass wine offerings, it's a great place to head for a power lunch or to hit up when you want an elevated meal in an environment that's upscale but comfortable. If you're looking to wow a few friends, however, try out the chef's table in the kitchen. Located mere steps away from the action, it's spectacle dining at its best. When I profile restaurants (which is to say when my visit is comped), I tend not to comment on the service, as it doesn't make much sense to do so in a context that's not blind. I will, however, note that even among comped meals there's quite a divergence in the level of service and that the staff here were amongst the most accommodating and friendly I've encountered. Take that for what it's worth.